Thanks for taking time to visit our page. You will find the playlist below. We had a phenomenal time with Yaves Ellis on Thursday night at Sovereign Grace Missionary Baptist Church in Peoria, IL. Brotha Mike opened up the show and Yaves shut it down. As humble as he is, he ripped the mic in two presenting the gospel. He basically delivered a sermon through spoken word, acapellas, testimony and music. God was glorified to the highest. We plan on having him back here again in the future. Today we have the brand new Lecrae and eshon burgundy songs. You can download the show for free at the links. Until next week...grace and peace! Brian "The Water Walkin' Warrior"
Thanks for taking time to visit our website. We're really excited about this week's show and the upcoming event with Yaves Ellis right here in Peoria, IL. You can peep below and on the main page. Follow us on Twitter @KingdomMindedRS for updates on this and on future events. We've loaded the show with songs that Yaves is featured on as well as some of his own. You can click the picture below to join the Facebook page and share with friends. Below are the poster and some links to his FREE projects that have been released. You can also see some videos and download all of Yaves' free music HERE. Download today's show for free here. Here is your playlist. Enjoy and be blessed! We hope something was stirred up in you to be Kingdom Minded. We'll see you Thursday night if you are close to Peoria. Thank you for visiting our page. We are here to serve you the music you seek. Let us know if you want to request any songs for next week's show. There's a special feature this week. We caught up with Brinson to ask him about his new album coming soon and are breaking his new single that will be available at iTunes on Monday. We've also got that new KB single from his upcoming album, "Weight & Glory". Below is some Peoria community news. There are "Stop the Violence" marches taking place each Saturday leading up to a planned outreach weekend in the end of August. 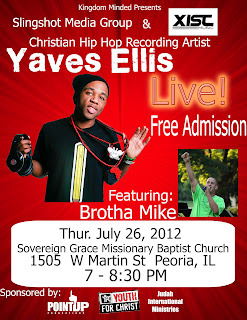 Yaves Ellis will be here live in Peoria on Thursday, July 26th at 7:00 pm. We'll be giving you more information about the location early next week. Follow us on Twitter @KingdomMindedRS for up to the minute news about this ministry event. On August 11, there is a revival planned to take place at Manual High School. There will be music, dance, food, and speaking. Tell your friends and let's gather for prayer, fellowship, and the advancement of the Kingdom for this event. We'll post more information about this event as well as we get details. We'll be setting the atmostphere from 9:30-10 am if you want to come out and see us. You can download the show for FREE here. Here is your playlist. Enjoy and be encouraged. Here is the brand new video by Tha GIM feat. Spirit and Truth for "A New Day." This has got to be one of my favorite songs to start the day with. We hope you enjoy it and are encouraged as the Lord blesses you with a new day. Thanks for taking the time to visit the Kingdom Minded Show's website. We have some fresh music for you this week. Lil Prophet dropped a new album, Big Fil and J.Moss both leaked new singles and we've got local Central Illinois music for you. We're planning an event for July 26th with Yaves Ellis here in Peoria, IL. Let us know if you need Kingdom music for your next event. 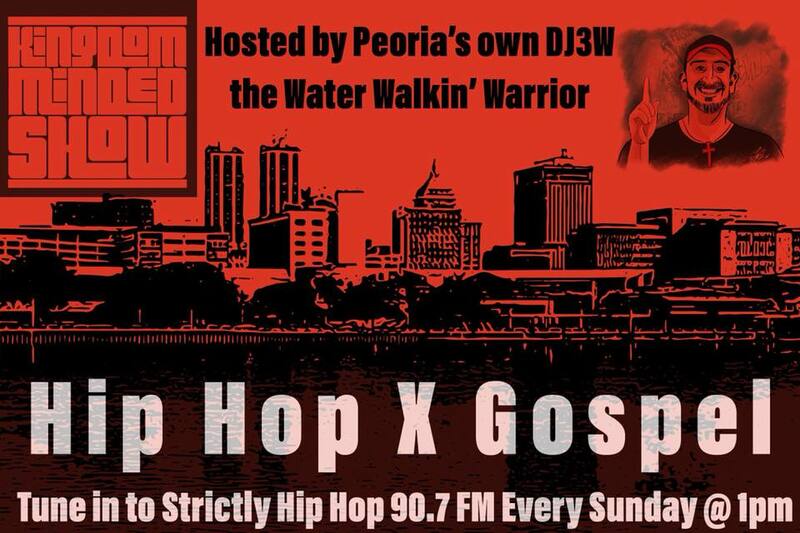 We have Christian hip hop, R&P, contemporary and traditional gospel in our catalog. You can e-mail us at KingdomMindedRadio@Gmail.com or call us at 775-375-KMRS and leave a message. Let's get into this week's show. You can download it for free at the link right below. Here is your playlist. We hope you are encouraged, challenged, and inspired. Work It Out (Cashin' Out PDub Mix) - Willie Moore Jr.